Hollow point rounds fit the bill if you're a 41 Remington Magnum shooter looking for self-defense. The 41 Magnum’s original intention was to be a be-all, end-all load for police revolvers. As such, the cartridge Magnum straddles the line between control and firepower. 41 Magnum ammunition is an extremely capable man stopper and loaded with hollow point ammunition, (HP or JHP) the weapon is quite capable of one hit kills. Hollow point ammunition expands when it contacts a soft target, this prevents the ammunition from over penetrating the intended target and striking an innocent person. Hollow points also expand and create much more damage throughout a soft target than a standard round. 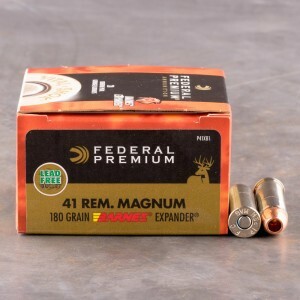 The 41 magnum is quite the potent round and combined with hollow point ammunition forms an excellent concealed carry weapon. excellent rounds and price. Tight grouping at 30 yards. Will order again in the near future!